Screamfest Film Festival 2017 First Wave Line-up and Festival Ambassador Announce! 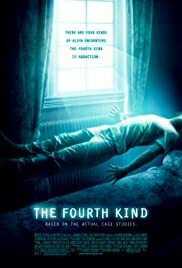 Q: Is "The Fourth Kind" based on a book? Q: Is the movie actually based on a true story? A fake movie should not pretend to be based on real events. Especially when the 'authentic' footage is made by actors. They go out of their way to do all but claim that it was based on real events. This movie is even worse than the Blair Witch Project, but at least that movie didn't pretend to be anything other than what it was. Terrible storyline, uninspired special effects, marginal acting. This movie has it all. I'm trying to think of something good to say about this movie, but I can't. I suppose Canada and Bulgaria are pretty (even though its supposed to be shot in Alaska...).